I still need to get my review up but honestly? Definitely enjoyed Struck. Also, yes, I also have this as an ARC; why did I buy a hardcover? Might have something to do with Jennifer Bosworth signing at Mysterious Galaxy (in Redondo Beach) on the 26th at noon. Might also have something to do with the fact that it's the book club pick of the month. If you've seen my review for Shadowcry, you know that I adored it and yes, I intend to read this as soon as possible--which in this particular case, means today. I'm so ridiculously excited to read this! And if you're wondering, yes, this is an e-galley from NetGalley and Penguin YRG. 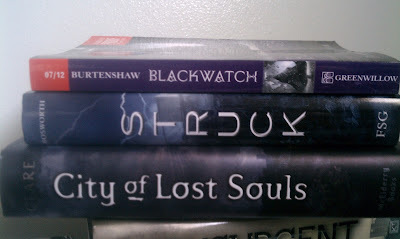 (And if I read more than one book at once, you better believe that I'd be reading this at the same time as Blackwatch. I usually get finished copies of the ARCs I receive because they are so much more prettier. plus I love supporting authors, and buying + reviewing helps authors! I understand re: COLS. I didn't enjoy COFA at all, and wished she didn't extend the series. D: but I do want to read COLS, so ha ha... I am a weakling like that. Ahh someone else with CoLS! I really need to get my copy! I love the cover of The City of Lost Souls! I hope you enjoy everything and here's my IMM + Weekly Wrap Up! I was thinking of getting Struck, but was going to wait until the Fierce Reads tour is at Mrs. Nelson's the beginning of June. Jay Asher was talking about, it and it sounded really good. I'm still waiting for CoLS copy, I hope it would arrive around next weeks. 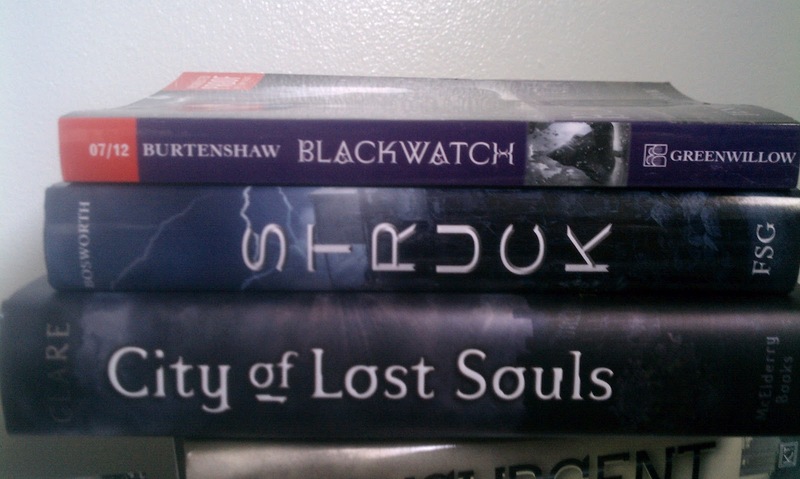 AAAHHH you got City of Lost Souls i'm so jealous :p I'm still waiting for my copy and I can't wait to read it. I hope you'll like all these books and happy reading :). Yay for all the books! I actually got tired of the Immortal Instruments when the 4th book failed to be...interesting. I really need to get Struck; it looks so good! Check out my book haul for this week! I'm pretty sure everybody got City of Lost Souls, because I've been seeing it a lot. I got it, and I'm reading it, but it's not as good so far as the first three were. Anyway, great haul and enjoy your books! Check out my My Stacking the Shelves post! I totally want Struck! I haven't had a chance to get a copy but I'm really looking forward to reading it.